The Jaguar is one of the four big cats in the feline world. They are often mistaken for the Leopard due to the many spots on the body. They have a very long body with a tail that be more than three feet in length. They have a dark brown or tan coloring with some reddish hints. They can also have some white areas around the black spots on their bodies. This look helps them to be able to hide in the wild and to sneak up on predators. 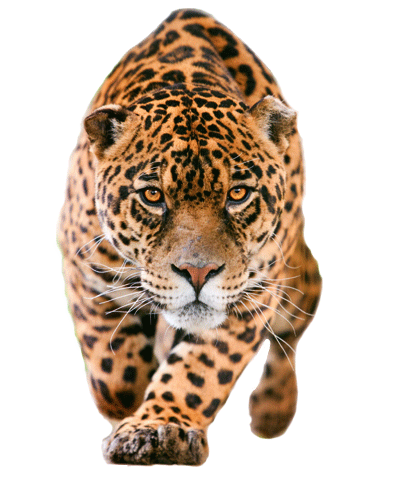 The overall size of a Jaguar can vary based on the location where it lives. The smaller ones are about 100 pounds. The larger ones can be up to 220 pounds. Males are often about 20% larger than the females. The habitat of the Jaguar covers most of Central America. They extend from Mexico to the Northern part of Argentina. They are limited to the area of Arizona in the United States and that has been the case for more than 100 years. However, they are found in many zoos around the United States. They are a huge attraction too. In their natural habit the Jaguar is found living both in the rainforest and on the open plains. These felines are very adaptable and that has helped them to successfully survive a variety of changes that have occurred in their natural environment throughout time. Plenty of those changes that they experience today are due to the fact that humans want to use those locations for living or to make money. Jaguars can vary from 124 pounds to 211 pounds. The Jaguar has one of the longest life spans in the wild of all felines. These felines enjoy their solitary lifestyle and they tend to steer away from the home ranges of each other. There are times when the females will have territory that overlaps with males. This is often due to the fact that the females have a smaller range they explore for food and water. There are many different vocalizations that the Jaguar is able to offer. They include roaring, purring, grunting, mewing, and even a sound that is very similar to a cough. The vocalizations will intensify during times when the female is ready to mate. There isn’t a set mating season for these animals. However, a lack of food and additional stress has been known to significantly prevent it from occurring. Aggressive behavior has been noted for the Jaguar when it comes to how they respond to other animals, however, recent studies have confirmed that males do not show strong aggression with other jaguars. They also will fight each other for mating rights with the females. The role of the Jaguars as mothers is one that has been well observed. They are very dedicated to caring for the needs of their young. There have been thousands of Jaguars killed in order for humans to have access to fur coats. The practice of this was once extremely high and the money being made on the fur trade was a great way for people to have lots of income. Today there are very few people that wear fur coats. This is due in part to changes in fashion as well as the influence of animal rights groups. The future for this feline is one that may not exist if humans don’t change their ways. Right now they are categorized as being near threatened. They continue to experience numbers that are dropping according to research. While there are conservation efforts in place there is still plenty that has to be done if we want to protect the Jaguar. With the right conditions the Jaguar can live in the wild for a period of up to 15 years and 23 in captivity.